From muck spreaders to sprayers, farmers and contractors were able to see the latest developments from Agrifac at a recent field demonstration. Jane Carley reports. VIDEO: Can Vicon’s new iXdrive self propelled sprayer compete? 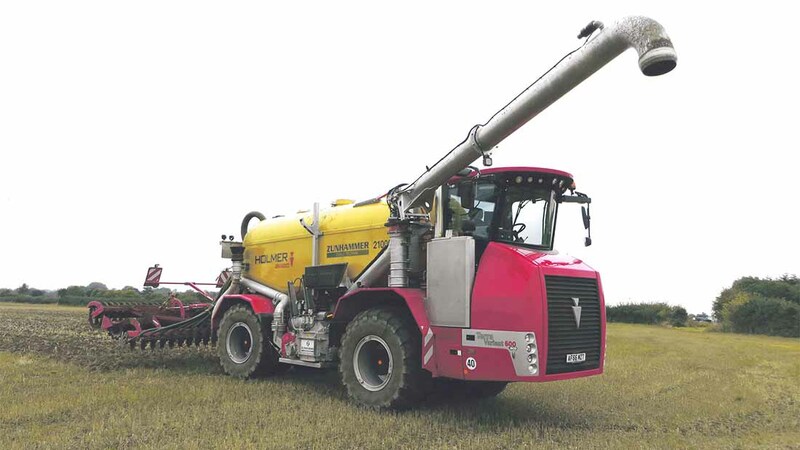 The developing Anaerobic Digester (AD) market has led to renewed interest in self-propelled slurry and muck spreaders, with several manufacturers vying for the space left when Challenger withdrew its Terragators from the European market. 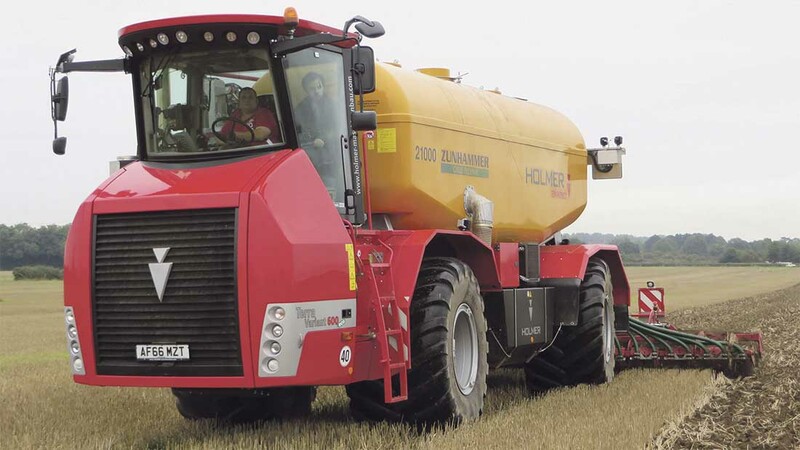 Agrifac’s sister company Holmer now focuses on one model of power unit, the Terra Variant Eco, which can be fitted with solid spreader bodies from Bergmann, Zunhammer liquid systems, and grain and beet chasers. A new addition is the Multibunker, a moving floor body with elevator suitable for maize and beet, with maximum capacity of 40cu.m. Body swaps can be made between all versions except the liquid system, which is specified as a dedicated unit. We look at the 598hp Terra Variant at the Muck and Slurry Event. The 254mm (10in) diameter loading arm swivels through 170 degrees to fill the 21,000 litre tank in under three minutes. The Terra Variant Eco is powered by a 598hp Mercedes V8 engine with auto reversing fan, married to a Funk DF 500 powershift transmission giving 18 by six speeds including an auto mode. Michelin Ultraflex 1050 tyres are standard, said to give a ground pressure of 1.9psi with a full load. 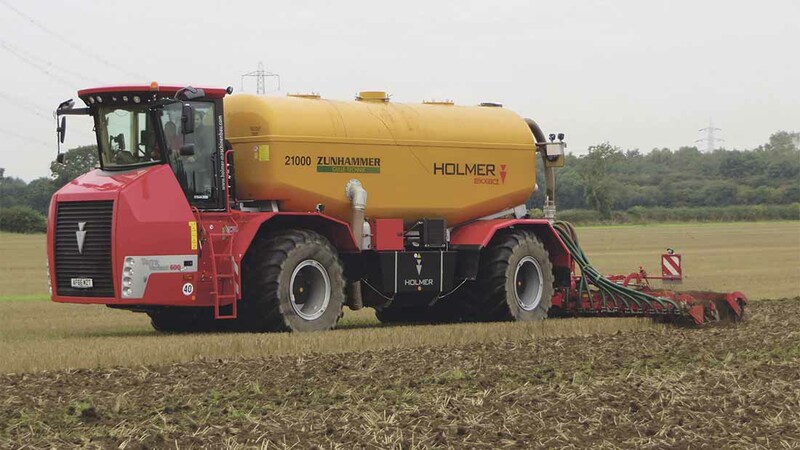 A result of an agreement between Holmer and German tanker specialist Zunhammer, the liquid system features a Vogelsang 9,000 litres per minute rotary lobe pump and 12,000 litres/minute RotaCut cutting unit. Using a 254mm diameter suction pipe gives a filling time of less than three minutes for the 21,000-litre tank. The loading arm is 5.7 metres long and swings through 170-degrees for easy filling, which is entirely controlled from the in-cab console. Crab steer places each wheel in a separate track and spreads the weight of the unit, minimising ground pressure. Crab steer puts the tanker out to a footprint of 1.5m (5ft) to minimise ground pressure while a pivoting implement linkage ensures the injector or dribble bar continues to track straight. A range of implements can be fitted. 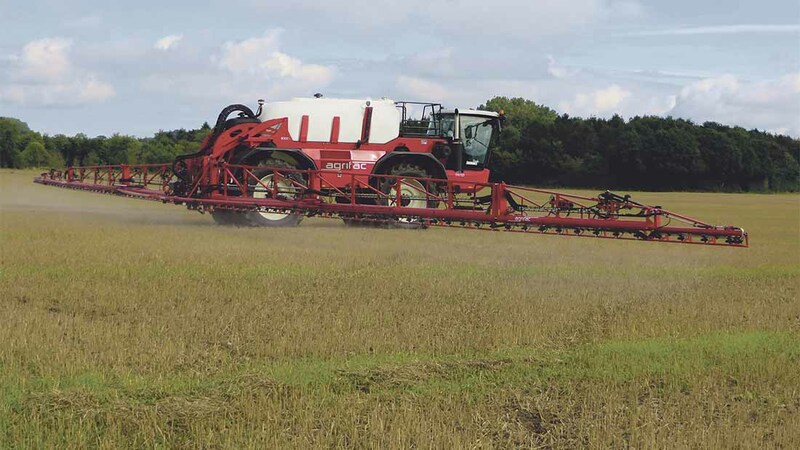 Agrifac suggests the Horsch Joker is a good match as an arable injector as it enables the digestate or slurry to be applied and incorporated in one pass. Vogelsang also offers a choice of dribble bars, including a new 18m Compact version which folds to less than three metres wide and uses its Comfort Flow Control pneumatic cut-off system to allow spreading at 12 or 15m, or to cut off one side for short work. A pull-type attachment allows switching from umbilical to tanker spreaders. 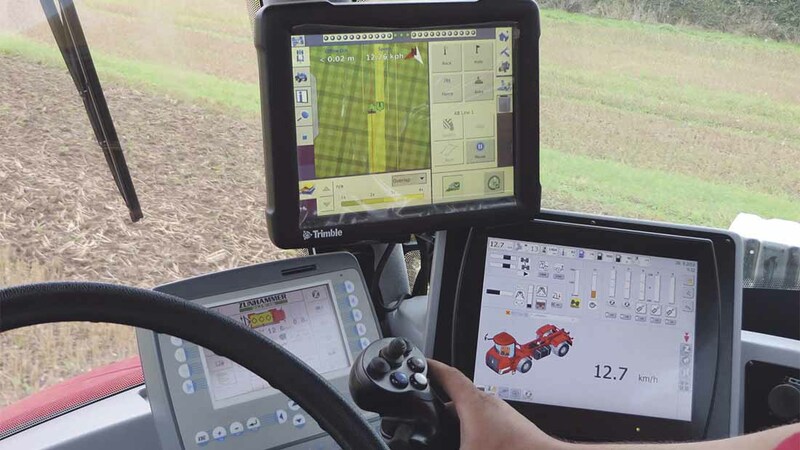 Machine functions and slurry application system use individual displays, while Trimble's FmX display takes care of guidance. For control, there are three terminals in the cab. The main Holmer screen monitors machine and driving operations including crab steer. The Zunhammer terminal is used to set and adjust application rates, display fill rates and monitor the pump and implement, while a Trimble FmX display handles auto steer and documentation. All of the main functions are controlled via a single joystick. Zunhammer also offers trailed nurse tanks with 15-18.5cu.m capacity, featuring GRP bodies said to reduce weight by 40 per cent compared with a steel tanker and thus boost payload. 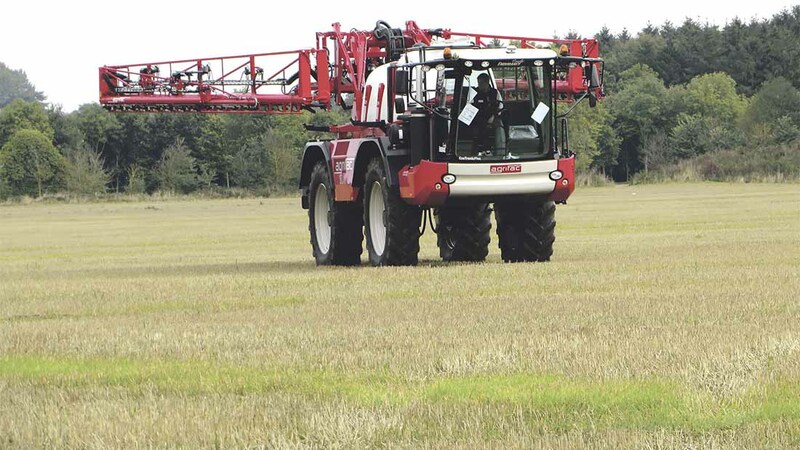 Agrifac’s self-propelled sprayers can now be specified with the Fast Fold Plus system, said to fold a 48-metre boom in 22 seconds. Using upgraded hydraulic valves and sensors, the folding process begins at 25 per cent of its full speed before reaching full folding speed and then slowing down again to reduce shocks to the structure. Check out our test of the Vicon iXdrive. With widths up to 55m seeing use in Australia, Agrifac’s Chris Potter says the company has eight machines in the UK fitted with 48m booms, while the 40m version is also proving to be a popular option where customers have an 8m drill. Flagship of the range is the Condor Endurance which has an 8,000-litre tank and is due to be upgraded for next year. The Condor 4 is available with 4,000- and 5,000-litre tanks and booms to 48m. Agrifac also showed an example of its Premium Proven used sprayer offer, a Condor 3 with 3,500 hours in it which has been refurbished and comes with a one-year warranty. Offering a saving of up to £80,000 over a new machine, this could be a good opportunity to move up to a self-propelled sprayer or expand the fleet.